Sometimes, when you write a food blog, work at both a bakery and a restaurant called Meat and Bread, and have dinner at your Italian friends houses regularly you end up eating cake for breakfast, BBQ beef sandwiches for lunch, pasta for dinner and ice cream for desert regularly. And when that happens you feel dreadful, not only right after but for a few days. 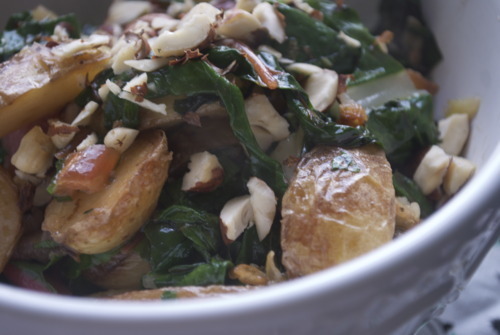 And when that happens sometimes you need a big bowl of veggies, lovingly cooked without butter, with some toasted nuts on top. You know, I’m just sympathizing here, that certainly isn’t me. I do not eat cake for breakfast. Not this health concious angel. Never. But in case you have that problem here is a bowl of local veggies, lovingly fried in olive oil, full of iron, protien, and vitamin B. In case you write a food blog, work at a restaurant and a bakery and have a lot of Italian friends. Just in case. 1 big handful of nugget potatoes, quartered, or a few yukon gold potatoes diced. 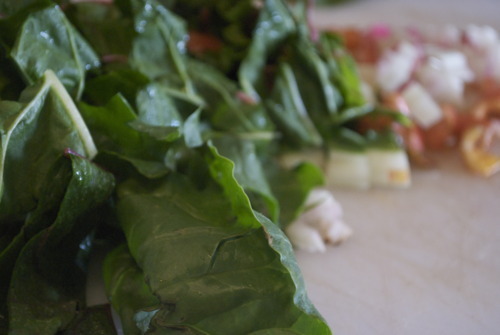 4-5 big stalks of Swiss Chard, cut into strips, keeping the stems and leaves seperate. Some fresh herbs if you have any kicking around, I used basil and mint, because thats all thats big enough to pick in my “garden”. 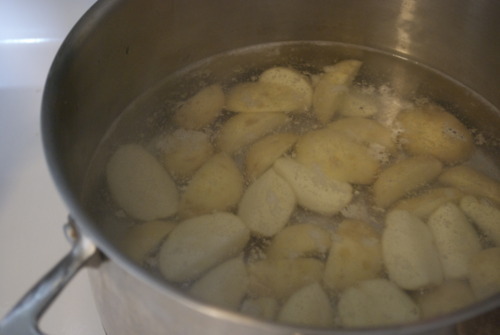 Put the potatoes in a pot covered by an inch or two of cold water. Put it on high heat and bring to a boil. 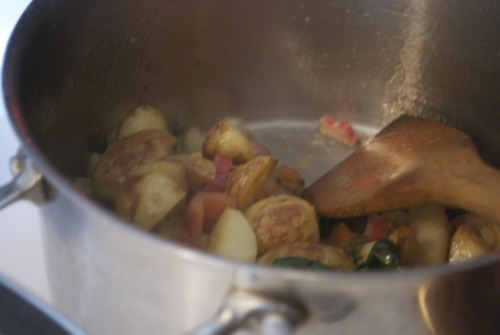 Let it simmer for about 5 minutes, until the potatoes are nearly cooked. 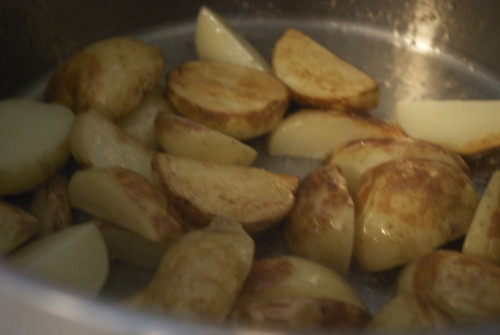 Drain the potatoes and in a frying pan (or in the same pot if you don’t want to wash two dishes!) put a good glug of olive oil and theme dump the potatoes back in. Add in a good pinch of salt. Fry them until they are nicely browned and happy looking. 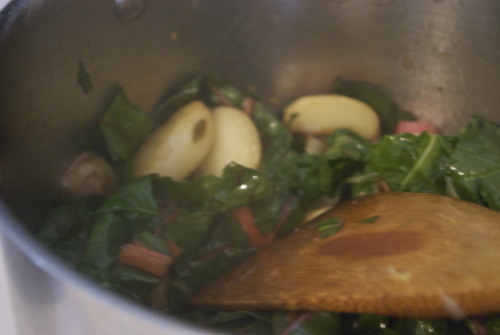 Add in the swiss chard stalks and fry them for a few minutes until they are soft and starting to brown around the edges. Add in the garlic and cook for a minute or two. Add some more salt here. 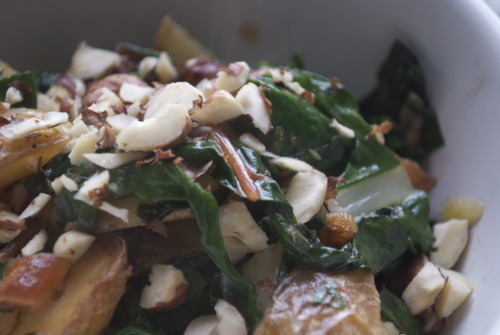 Toss in the leaves of swiss chard and cook until wilted and delicious. Add in the capers, lemon zest and herbs. Mix to combine. Put it all in a couple bowls and finish with the hazelnuts. I was thinking while I was eating this that some shaved parm would have really completed it, but of course, that was an unhealthy thought.